The warm summer months are starting to make their way to the front of the calendar and there is no doubt that you’ve already got at least a few big events on your radar. If you’re anything like me, when you get an invitation to something fun like weddings, summer parties, baby showers, bachelorettes or engagements your first thought is ‘Can I go?’ and your next thought is ‘What will I wear?’. This question used to result in an almost immediate online shopping frenzy in which I’d order a few cheap, ill fitting or at least highly body conscious dresses and undoubtedly a pair or two of sky high heels that were bound to leave me crippled. Super fun. Except not. Now since I began changing my ways to more intentional, responsible purchases I’ve found that formal attire for such events as noted above is not all that easy to come by. I’ve had countless emails and messages asking for suggestions and after a few very brief searches I decided to dig in and put together a proper resource for the best responsibly made formal wear in a wide range of price points that is not only thoughtfully made, beautifully designed but versatile too. Trust me when I say this was no easy feat, but a worthwhile endeavour indeed. If you’re in the market for something to wear to a more dressy event this summer please take a look! I’m sure you’ll discover at least a couple options that could work for you. Let’s dig in and get a little fancy!! PRICE POINT: I did my best to discover and include brands that met the above criteria within a wide range of price points (as noted in the pricing scale). As we know, responsible style often comes with a heftier price tag and that is no different in this category, however, I was happy to find many more affordable options than I’d anticipated. That said, formal wear pieces are an investment and if you plan to wear the piece many times, they’re well worth it to have something you feel great in. Both because it fits amazing and because it was thoughtfully made. VERSATILITY: I don’t have a ‘formal’ capsule per se because I like to dress my pieces up and down depending on the occasion. So with that in mind I looked for brands/items that could work for both formal and more casual uses. Don’t be afraid to rock a maxi-dress with heels and a clutch to a wedding one day and then with sandals and a tote the next! What I mean is that I steered clear of ‘pageant’ style gowns (for obvious reasons) and focused more on simple elegant pieces with lots of potential. ACE & JIG – $$$ – Made responsibly in India – A cult favourite of ethical shoppers boasting stunning patterns and woven fabrics. Check out the Troy Gauze Dress for a gown option, the Soiree Dress for a cocktail event or the Solstice Jumpsuit for a playful statement. AMOUR VERT – $$ – Made responsibly in the USA and ethically outsourced. 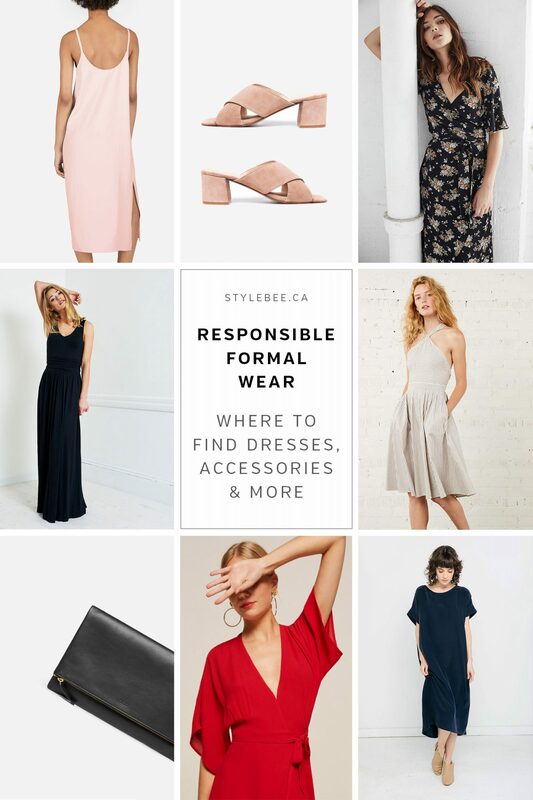 – Lots of silky cocktail and wedding guest ready options made from eco-conscious materials like organic cotton and tencel. Check out the Lavina Dress in the prettiest paradise print or the Flavie Dress for feminine flares and a floral print. BLACK HALO – $$$ – Made in USA – Ultra clean lines with special statement details like ruffled sleeves to make a bold impact. Check out the Deklyn Jumpsuit. BRASS CLOTHING – $ – Made responsibly in China – Simple styles and functional fabrics. Check out the Tank Maxi for a more formal function and the Cocktail Shift for something flirty. CHRISTY DAWN – $$ – Made in USA using deadstock fabrics – Easy fitting dresses in breezy florals and pretty patterns. Check out the Dawn Dress for a flouncy femme look and the Arrow Dress for a great neckline and a shorter length. DÔEN – $$ – Made responsibly in India – Perfect for the modern boheme looking for flowing fits and feminine patterns. Check out the long-sleeved silky Willow Dress. ELIZABETH SUZANN – $$ – Made in USA – Personal favourite of mine for minimal designs with loose cuts in delicious natural fabrics. You really can’t go wrong with any options but keep a close eye on the lead times. Check out the Georgia Midi, the Mara Jumpsuit and the Artist Dress. EILEEN FISHER – $$$ – Made responsibly in USA + Elsewhere – Timeless, versatile styles in effortless shapes and fabrics. Check out the Silk Midi Dress with waist tie for an easy elegant option. EVERLANE – $ – Made responsibly in China – Elegant, minimal styles in signature GoWeave fabric for wrinkle resistance and breathability. Check out the Slip Dress for a timeless look and the Cocoon Dress for a modern shape. Receive $20 OFF your first order when you sign up here. JAMIE + THE JONES – $$ – Made in the USA – Super simple cuts in a wide range of gorgeous tones. The Midi Dress is just begging to be dressed up for a fancy night out or down for a low-key day. MODA OPERANDI – $$$$ – If you’re not concerned about budget then this is the place to go. All the high end, off the runway designers in one place from Oscar de la Renta to Dolce & Gabbana to Emilia Wickstead to Elie Saab to Marchesa, you name it. For this caliber of clothing you’ll find most designers make their clothing in the UK, Italy and USA. Honestly, this site is worth a visit just for day dreaming. MONSOON – $ – $$ – Made ethically throughout Asia – A wide range of dress styles for all occasions in simple satins, intricate beadwork patterns and bold prints. 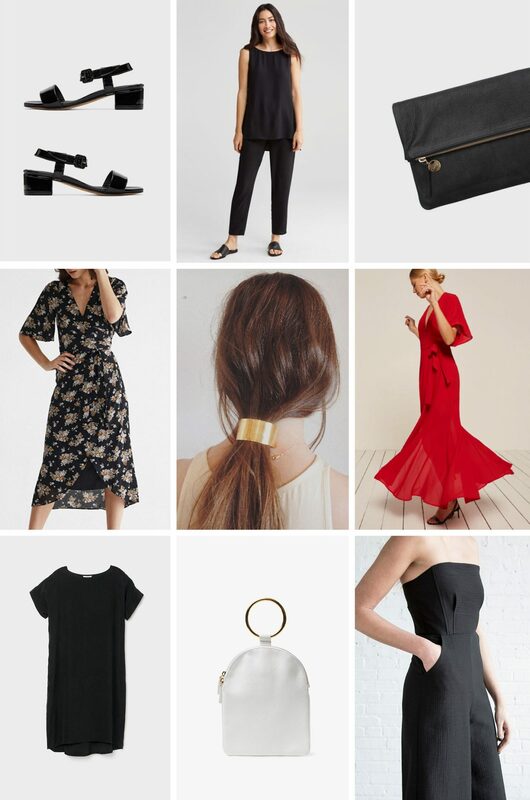 Check out the Topazalite Dress for a gala, the Winona Jumpsuit for a wedding or the Binki Panel Dress for a timeless cocktail option. NEW CLASSICS STUDIO – $$-$$$ – Canadian boutique carrying all responsibly made brands. 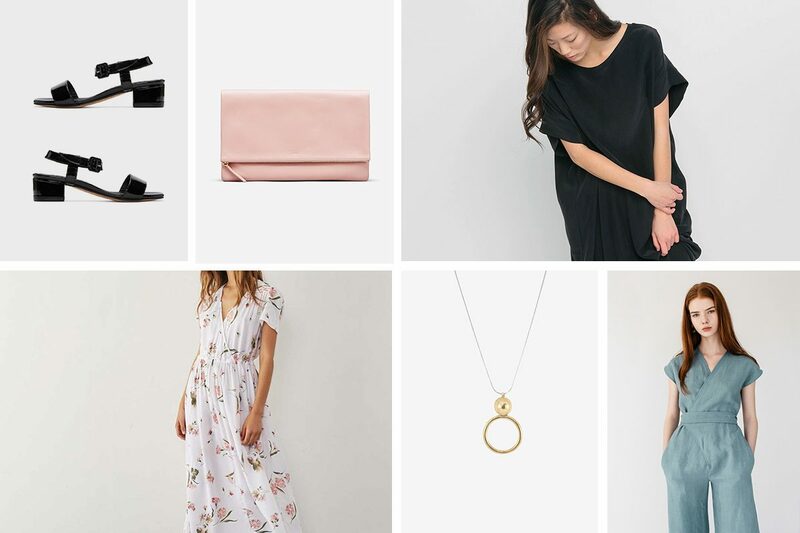 – This Edmonton based e-shop carries some seriously sought after favourites like WRAY, Paloma Wool, Shaina Mote, KOWTOW, Base Range & Eliza Faulkner. Check out the Nantes Dress by Wray and the Raku Dress by Shaina Mote. OF A KIND – $-$$$ – Responsibly made one of a kind apparel and accessories from indie boutiques and brands. – Similar to Garmentory however items are designed exclusively for the Of A Kind marketplace. For dresses check out the Cardinal Esclara by Reif Haus and the Charlotte Silk Dress by Megan Huntz. REFORMATION – $$ – Made in USA using deadstock fabrics – A favourite of all LA cool girls, this line uses deadstock fabrics and designs some seriously fabulous pieces for both the daring and the darling. Check out the Winslow Dress or the Plantain Jumpsuit for some daring options. RACHEL PALLY – $$ – Made in USA – If you’re looking for a great beach event or mid summer options this collection of jersey pieces is worth a look. Check out the Long Cutout Dress for a chic black maxi or go for some colour in the Lita Dress. THE PEOPLE TREE – $ – Made Sustainably and Fair Trade in India – Great options for cocktail dresses and other semi-formal occasions. Check out the Rebecca Dress for a timeless shape and universally flattering fit or try the Belva dress in an equally chic shape with a fun print. VETTA – $-$$ – Made in USA using sustainable fabrics – This flirty collection is made up of mini capsules and full of great mix and match options and cute pieces. This is a gem of a find and I’ll be styling the Wrap and Slip Dress on Monday! In the meantime check out the adorable Two-Piece Dress and the Swing Dress. Receive 10% OFF your order with ‘STYLEBEE10’ valid through May 24th. Ah, the ever elusive ideal event shoe! I don’t know about you but I’ve spent far too many hours in agony thanks to less than forgiving footwear. Plus if you’ve even tried to walk on grass in a slim heel, you’ll know that any efforts are futile. 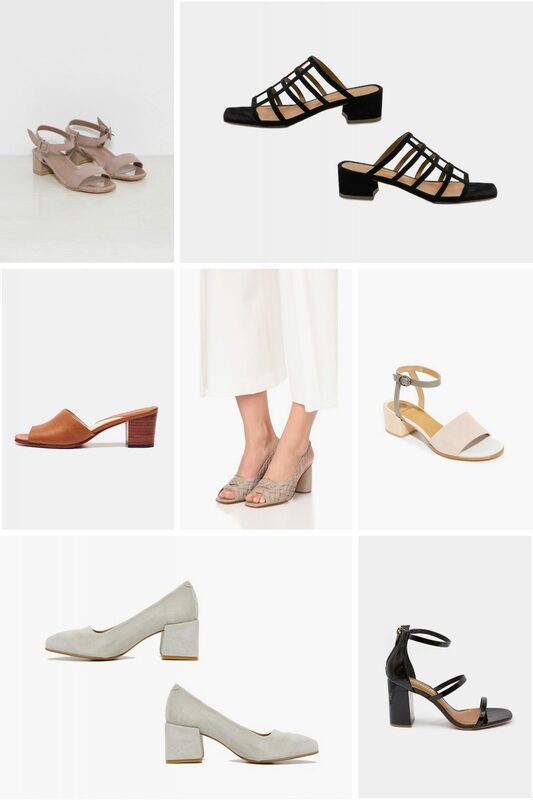 So I’ve hunted down the best dressy shoe options that shouldn’t kill your dancing buzz and won’t leave you several inches shorter than intended on the lawn (read: lots of block heel finds). I’ve also looked for options that you could wear with jeans and a cute top for a girl’s night out or even to work if you really wanted! You should also know that I’m a shoe girl and I really really love a cute pair, so this section was particularly fun to ‘shop’ for. AMOUR VERT – $$-$$$ – Carries several ethical shoe brands, namely Charlotte Stone – Check out the Morley Mule. BY FAR – $$ – Made responsibly in Bulgaria – Check out the Grid Sandal. | Receive $20 OFF your first order when you sign up here. COCLICO – $$$ – Made responsibly in Spain – Check out the Julian Wedge. EVERLANE – $ – Made responsibly in Italy – Check out the Day Heel in natural suede. L’INTERVALLE – $ – Made responsibly in Spain – Check out this entire line if you haven’t already, particularly the ILLY Slide (runs wide or it’d be mine) and the FOXIN Sandal. Receive 10% OFF your order with ‘STYLEBEE10’, valid through July 31st. LOQ – $$-$$$ – Made in Spain – Check out the Villa Heel. MARAIS – $$ – Made Responsibly in LA – Check out the Jane Mule. MARYAM NASSIR ZADEH – $$$ – Made in Turkey. Check out the Sophie Sandal for a timeless style that’s elegant and comfortable. MNZ shoes are also available on ShopBop and SSENSE. NISOLO – $-$$ – Made responsibly in Peru – Check out the Sarita Wedge Sandal. THE PALATINES – $$$ – Made by hand in LA – Check out the Salio Mule for a sculptural option. POPPY BARLEY – $$ – Made responsibly in Mexico – This line is known for their ultra comfy footbeds and offers a range of widths. Check out the Slingback and the Mule. RACHEL COMEY – $$$ – Made in Peru – Extremely high quality in both classic and statement styles. Check out the Lyell Wedge. When you’re looking for a great multi-purpose clutch or smaller bag for events my #1 advice would be to opt for neutrals. Of course there are lots of good arguments for the ‘pop of colour’ through a clutch or accessories and if that’s your jam then many of these designers will have something for you. But if you want it to be something you can wear with tons of different looks then stick to black, white and natural tones for the most versatility. Personally, I have a black nubuck clutch and natural leather clutch and two hair on hide clutches in neutral patterns and so far I haven’t desperartely needed anything else! If I’m being honest though, I’d love a clean white one! BAGGU – $ – Made in USA – Lots of great minimal options but the Mini purse and the Circle purse are amazing. BEMBIEN – $$ – Handmade by artisans around the world. Check out the beautiful handwoven Rose Bag. SIMILAR WOVEN BAGS AVAILABLE VIA ETSY. BIRKIN BASKET – $ – Handwoven in Portugal – This summer’s it bag but also a timeless Parisienne classic. CLARE VIVIER – $$ – Made in LA – The Foldover Clutch in black nubuck is an all-time personal favourite of mine. 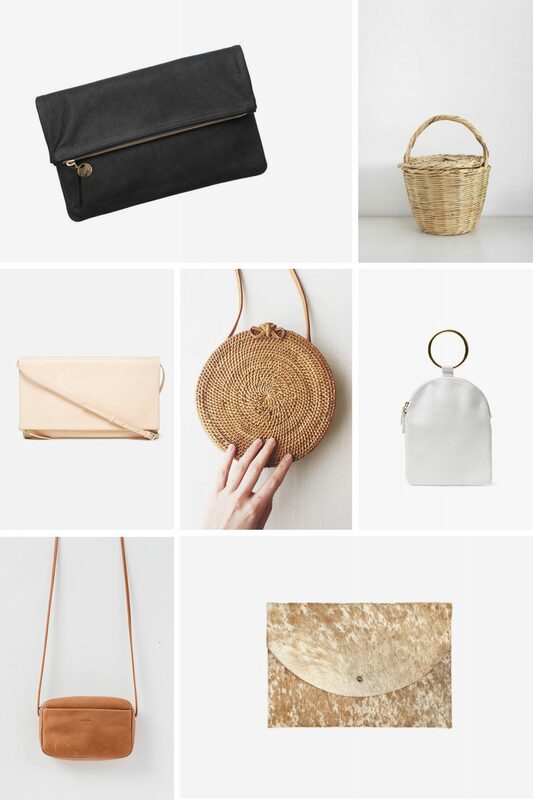 EVERLANE – $ – Made in Spain – Check out the Foldover Pouch in natural. LIZZIE FORTUNATO – $$ – $$$ – Made responsibly in India – Check out this NYC it designer’s ultra statement embroidered convertible clutches, especially the Folk Safari Clutch and the Hibiscus Clutch. NISOLO – $ – Made responsibly in Peru – Check out the Luisa Clutch for a chic asymmetrical classic. OTAAT/MYERS COLLECTIVE – $ – Made in the USA – Check out their very cool signature Ring Pouch (which happens to be on my wishlist). PRIMECUT – $ – Made in Portland Oregon – This line is a personal favourite. Check out the Envelope Clutch. I’m not sure that I’ve ever bought jewelry with the intention of only wearing it for a special occasion and I certainly don’t intend to start now. Instead I like to invest in pieces that are simple but impactful and can be work with both a silk gown or a cotton tee depending on the day. Personally, I’m drawn to circular shapes and gold metal tones as those suit my skintone best but the designers noted below offer a wide range of timeless, minimal, statement making styles in gold, silver, rose and brass. Many brands also have a broad range of designs in case you’re looking for something more intricate or elaborate. ANOTHER FEATHER – $$ – $$$ – Made in Portland from sustainable materials – My personal favourite is the Delos necklace. ATTIC – $$$ – Made in Toronto from recycled gold and responsibly sourced gems. – This line is my go-to for investment pieces. I have the Dome Studs and wear them 24/7 but have been coveting the Cigar Ring for ages. BIKO – $ – Made in Toronto – This line has so many fun pieces in both simple and intricate styles. I’m a huge fan of the double dot bangle. CLAUS – $ – $$ – Made in USA – Some many lovely classic designs. I’m personally a huge fan of the Split Ring. EVERLI – $$ – Made in USA – Beautiful collection of organically inspired shapes. I wear my You are What you Love I ring all the time. LIZZIE FORTUNATO – $$$ – Made in NYC – Check out this NYC it designer’s ultra statement jewelry, especially the Crater earrings, the Totem Tassel earrings and the Modern Tennis Bracelet. MEJURI – $ – $$ – Made responsibly by worldwise artisans – Lots of simple, classic styles. I’m really into the black diamond necklace. MICHELLE ROSS – $$ – Made in Toronto – Amazing range of minimal to statement pieces in a broad range of mixed materials. I personally love the Fema Necklace on a simple dress or the Nika earring for a large hoop. NISOLO – $ – Made in Kenya from up-cycled materials – Check out the Hammered Hook earrings and the Wire Cuff. STVDIO BROOKLYN – $$ – Handmade in USA – I adore the pieces I have by Erica and especially love the Colette Hoop from this season. VRAI & ORO – $ – $$ – Made in LA – There are so many perfect timeless classic minimal options in this line but the Stacking Ring Set has been on my radar for ages. YOUNG FRANKK – $$ – Made in USA – One of my all-time favourite jewelry lines. I just bought the circle orb necklace and it’s amazing! | Receive $20 OFF your first order when you sign up here. When it comes to doing my hair for formal events I usually keep it super simple with the exception of the rare occasion in which I’m having it done professionally. Plus, for the most part, most fancy events are in the summer and with the humidity and unpredictability of the weather it’s best not to over’do it (pun intended). So with that in mind, I pulled together some ideas from my HOW DO YOU ‘DO Pinterest board that I thought could work for a wide range of hair types. 1 – SIMPLE WAVES – This one is a no brainer go to for me. If it’s not calling for rain I’ll usually go this route and curl my hair first thing during the day so the waves are loose and natural by the late afternoon. 2 – FRENCH BRAIDED BUN – This one is a good option for medium to long hair on humid days. Simply french braid your hair to the end and wrap the long ‘tail’ part into a bun and pin. Spray with some hold spray to keep fly-aways down. 4 – LOOSE LOW BUN – Always a good option for a chic look. I roughly pull my hair back (the more bumps and imperfections the better) and use a hair elastic at the base of my head. Then I wrap sections around the band and pin them into place. I use a comb to pull out some front pieces and lightly curl them for texture. 5 – FRENCH TWIST – I love this timeless classic when it’s left a little loose and unfinished. Perfect for a more formal event. See the tutorial here. 6 – HALF UP BUN + CURLS – This is a great option for lots of hair lengths. 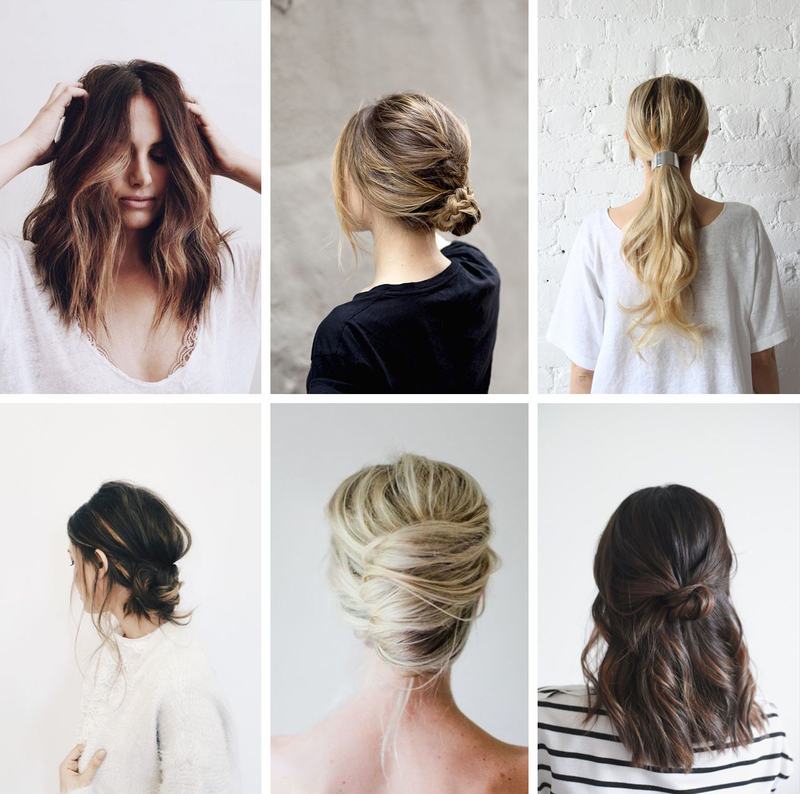 Some curls and a loose half-up bun to keep your hair off your face. Much like my hair, I like to keep my make-up pretty basic for special events and usually I’ll just go one or two steps farther than my typical everyday routine. I try to avoid ‘clown face’ by sticking to natural palettes and play up only one or two (max!) features at a time. 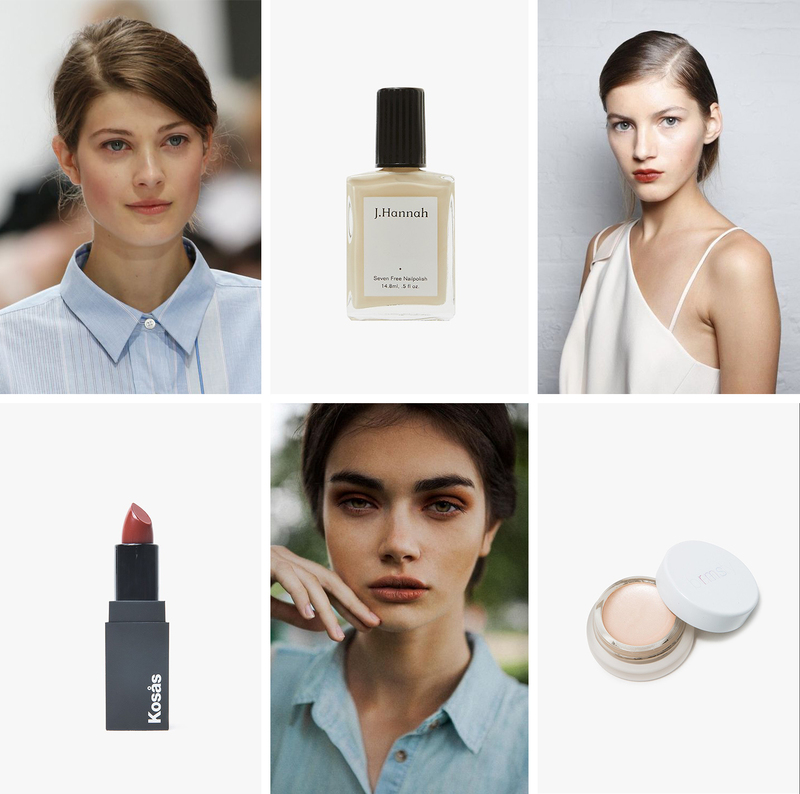 To get you started I pulled my 3 favourite event make-up looks from my Pinterest board BEAUTY and grabbed a few products that are perfect for any chic, timeless beauty repertoire. 1 – SUMMER PEACH – I love this beauty look for a baby shower, bridal shower, engagement party or just about any other daytime event. After playing up your cheeks with a peachy hue and filling in your brows you just need a few swipes of mascara and a tinted balm on the lips. 2 – NEUTRAL NAILS – Definitely go for a bold nail colour if that’s your jam but I’m more of a fan of neutrals, especially if it’s going to be on for a while. I’m obsessed with the new nail colour line from J.Hannah which is full of hard to find earthy tones and soft off-whites to give your mani/pedi a special touch without getting carried away. Not to mention that they’re free of all 7 harmful chemicals found in most polishes. 3 – HIGHLIGHTED + BOLD – This a great option for a more dramatic look. Use a bit of luminizer on your cheeks, temples and the bridge of your nose to help the light cast off those spots in a flattering way. Follow-up with a bold lip colour, brushed up brows and a few swipes of mascara. 4 – BEST LIPSTICK – This lipcolour line by KOSÅS has become my absolute favourite. It goes on so creamy, stays put (until you eat a meal of course) and doesn’t dry out your lips. You can build up the intensity you’re looking for easily or simply swipe it over a layer of balm for a bit of pigmentation. 5 – GOLDEN GIRL – This is the most dramatic makeup I’ll typically attempt. I love a filled in brow and a warm smokey eye paired with an even skin tone that has just a touch of bronzer and a natural lip. It’s quite sultry and perfect for an evening look that’s sophisticated and elegant. 6 – LUMINATE – I wasn’t sure about highlighters and certainly wanted nothing to do with sparkles so finding the right option wasn’t easy. Once I found the Living Luminizer by RMS I never looked back. It’s a creamy, glitter-free highlighter with a translucent, satin-pearl finish. This product is certified organic and has moisturizing elements so it won’t dry your skin out either. 1 | SOPHIE SANDAL | After a solid year of dreaming about these shoes I bought the Sophie Sandal by Maryam Nassir Zadeh for myself as a 30th birthday treat and I’m SO glad I did. They’re the perfect sleek black sandal for any occasion and a dream to wear. Lot’s of sizes and MNZ options available at SSENSE. 2 | THE SYSTEM SET | LONG SHELL + SLOUCHY PANT | This set was part of a collaboration I did with Eileen Fisher and I can’t tell you how handy it’s been when I need to look polished and elegant. I’m excited to make it work harder this summer for lots of events. The best part is that it can be made to look super elegant with heels, red lipstick and a clutch, or totally chilled out with flats and a loose duster coat. 3 | FOLDOVER CLUTCH | I bought this clutch in 2013 when it was first becoming popular and it’s been under my arm countless times since. It has a surprisingly large capacity for cards/cash, phone, lipstick, sunglasses, keys and just about all the other must-have essentials for a night out. 4 | WRAP + SLIP DRESS | This dress was a recent addition to my dress collection by VETTA. I’ll share lots more on this piece when I style it next week but it’s made in NYC from sustainable materials, it’s two dresses in 1 and it’s pretty awesome. In the meantime, if you love something from VETTA (there’s a lot to love!) use ‘STYLEBEE10’ to receive 10% OFF your order through May 24th. 6 | WINSLOW DRESS | This is still a wish list item that may or may not make it’s way to my life but how killer is this cherry red Winslow dress from Reformation? It might be a little too risque for me in reality but it would certainly spice up my closet! 7 | GEORGIA MIDI | This classic beauty by Elizabeth Suzann has been in my closet for a couple of years now and it’s still a favourite. I’ll be sharing how I style it three ways on Friday! 8 | LARGE RING POUCH | HOLY perfect white bag much? This little number is another wish list item of mine that has a pretty good chance of joining my clutch collection. 9 | BLACK JUMPSUIT | If I was in the market for a dressy black jumpsuit (which I’m not) this one by Rachel Comey would definitely be my top choice. It’s got all the good things like a minimal design, wide legs, a high waist and pockets! This would be a great option to dance the night away in one day and wear to brunch with a denim jacket the next. THANKS FOR CHECKING OUT THE RESPONSIBLE FORMAL WEAR GUIDE! DID ANY OF THESE SUGGESTIONS CATCH YOUR EYE? DO YOU HAVE ANY FAVOURITES THAT WEREN’T ON THE LIST? LET ME KNOW AND I’LL UPDATE THE POST WITH YOUR SUGGESTIONS. SEE YOU ON FRIDAY WITH A 1 PIECE – 3 WAYS POST FEATURING THE GEORGIA MIDI FROM ELIZABETH SUZANN! Lee, thank you for the tremendous amount of effort that went into this research, I am grateful to be able to benefit from it! This is a very thorough guide and leaves no excuse not to be a conscientious consumer! I already shop a few of the brands you’ve covered and looking forward to discovering others. Well thought-out and comprehensive. Your research and work is much appreciated! Due to much higher than normal volume, our current lead time for made-to-order garments is 8-10 weeks. Thankfully, I live in a region with a long summer! What a great resource, thank you! I hope the low block heel never goes out of style. Super thorough post! Thanks for putting this together! Wow! What a compilation. I can’t wait for a big chucnk of time to dig in to this. This is the most gorgeous round up of formal wear I’ve ever seen! We’re honored to be included! Thanks for the great resources! I’ll definitely take a deeper look into all of this. I don’t see the source information for the photo collage at the top of the post. Where can I find that blue dress? Love this list! My wedding dress was from Theia – I don’t know the whole supply chain, but my understanding was that they are responsibly made. Their dresses are beautiful, soft, and fairly affordable for a gown. I got mine (silk with cotton lace) on sale for 750 USD. Not cheap, but much cheaper than some of the scratchy polyester monstrosities I encountered. Thanks Yael! I’m sure your wedding dress was gorgeous! One of their dresses was a top contender for me too. According to my dress consultant they have a responsible production chain. Much of their intricate work is done in India but their gowns are assembled in North America. For bags, not sure if you checked out M0851. They are from Montreal, have great everyday bags and a couple of simple clutches, priced in the $$ range. Thanks for the suggestion Helen! I will definitely take a look at M0851. I’ve heard great things about their winter coats but it’s good to know their accessories stand up too! what a comprehensive list, thanks for sharing! Hello, Lee! Thanks for this post. I’m curious which shade of Kosas you like? Your lip hue recs alsways seem to work for me. Cheers! Ditto ditto ditto to all comments of yahoo & thanks & you are brilliant? Classic. Elegant. Edgy. For all ages. Beauty. Lovely. Wow! Bravo, Lee, bravo. This is a wonderful resource and you’ve exceeded my expectations with all the shoes, bags, jewelry, and beauty tips! I’m looking forward to your 1 piece 3 ways with the Georgia Midi, as I FINALLY just got one. It’s been on my wish list for years and I finally went for it. I’m also looking forward to your styling of the Vendetta wrap dress. I might buy that because it seems so versatile. I’m lusting over that Rachel Pally Lita Dress but I feel I’d wear it once and then never again. 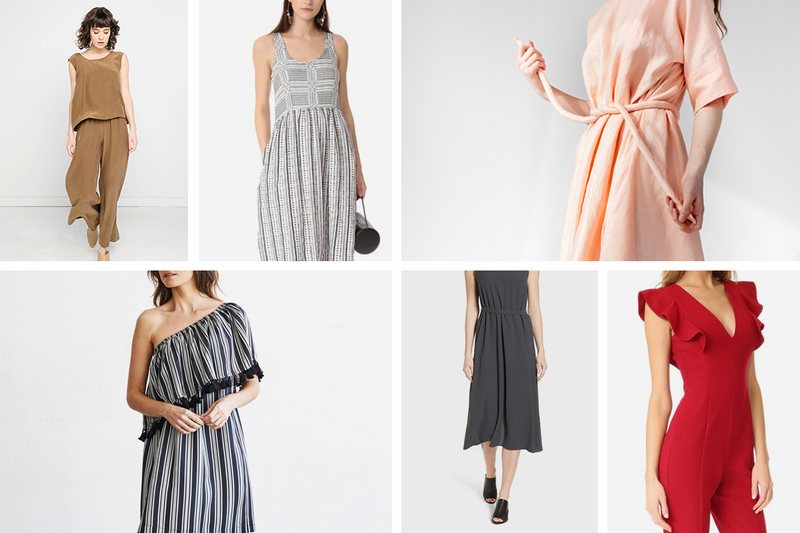 Hoping to snag some things I can wear in multiple settings and I think the Vetta wrap dress fits the bill. Regarding your favorite items: (1) Which color in the Kosas lipsticks do you have? (2) Would love to see what you wear the Sylvain hair pin with! I have the 021 barette and now wishing I had the pony holder. Big thanks! Thanks so much Shae! I so appreciate the positive feedback. You’ll love your Georgia Midi so much! I’m so excited to style the VETTA wrap dress too. It’s outside my usual style wheelhouse but feels so great on and is super flattering! I have the KOSAS lipstick in both Stardust (very close to my natural lip colour but just a bit rosier) and in Fringe and deep merlot-esque colour that is my go-to for any time I’m aiming for a bold lip. I seriously want them all! Such a wonderful list! Thanks for taking time to dig in and do all the hard work! One of my favorite jewelry designers is Jen Moulton (https://www.moultonatx.com). I own several of her pieces. She’s changed her business over the years so some of what I own is no longer available. But she offers minimal/simple jewelry that’s easy for every day wear, but I still get lots of use for formal occasions. Also, another favorite for bags/jewelry is https://storyweavermercantile.com. I have a couple clutches (one neutral leather, and a pop of color patterned one), and a couple necklaces. They are my go to for formal, but everyday occasions as well! Plus, they are generally in the $-$$ price range, and the brands she supports all have awesome stories! I love Amour Vert, and am glad you included them! They sent me a catalog a long time ago but I’ve yet to see them much on the ethical blogs (at least the ones I follow). They come out with new, tempting patterns fairly regularly. A note if you’ve just discovered them: if you see a pattern you like but not in the cut you are interested in, they generally roll out new patterns slowly, so it might eventually be offered in the shirt/dress you like. Also, you didn’t mention it but they use environmentally-friendly fabrics like organic cotton, silk, and tencel. / Ok infomercial over! This is faaaabulous, Lee! Thank you for this resource – I’m sure I’ll be coming back to this post again and again. Particularly love your beauty look suggestions. Oh, and thanks for including those wedding gown leads !! I recently ordered the Astral Crossover Dress from Elizabeth Suzann with the hopes that it will fill a classic-formalwear hole in my closet. Here’s hoping it works out as a great LBD! What a great and impressive source of responsible brands. Bravo for doing this much research and compiling it together. Not to give you another one to add to your list – but have you heard of ofakind.com? They partner with emerging designers (they’ve included Young Frankk, Lizzie Fortunato, and others) and do limited exclusives ( x of a kind). I’ve purchased jewelry, a purse, and clothes from them and still love and use everything I bought. Top notch customer service as well when weird issues arose.